Conferences are just around the corner! 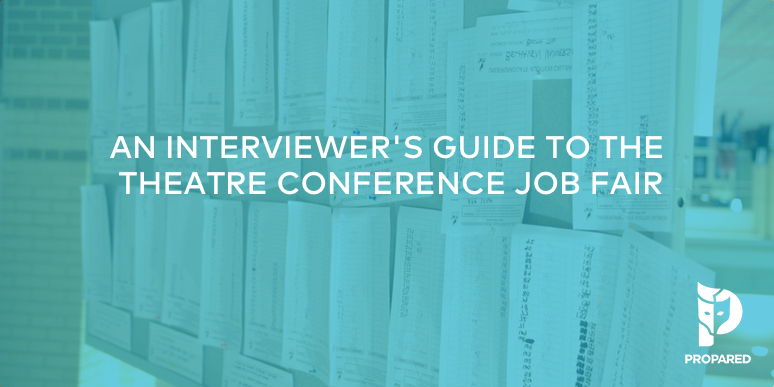 If you work for a regional theatre company, university, or summer stock festival, odds are you’ll be doing some recruiting. And that means hours upon hours of interviews at the conference job fairs. We already know how stressful it can be to interview a single candidate and sweat over whether we’re making the right hiring decision. But multiply it by 25 or 50? In a single day? Are we crazy?!?!? It makes for an exhausting day. It’s hard to find managers and technicians who will be a good fit for your company. When hiring, here are some considerations that will give you a better chance of finding the right folks, and still surviving the whole weekend. With so many interviewees, think about how to really get to know each person so they stand out in your mind. Avoid asking about shows they’ve worked on or skills they have. A quick glance at their resume will tell you that. The purpose of the interview is to get to know them as a person and find out how they will react to new situations. How would they handle X? Ask about their hobbies too. Have fun with it! You might as well right? You’re all in this crazy marathon together! Treating the interview as more of a casual conversation helps everyone loosen up a little – revealing a lot more about the “real” them and not the “nervous interviewee” them. Record simple facts about each candidate. It can be small things like where they are from or special skills they have. Be specific. Take notes during the interview. It may feel awkward, but if you wait you run the risk of omitting certain observations from your notes or, even worse, blurring them together with the next candidate. These small facts can help you keep people straight after the 4th “John” has been by. Make sure however to not use physical characteristics, gender, or other details that could be misconstrued as biased or discriminatory. You’re going to be talking. A LOT. Keeping your voice in working order is very important. It’s hard to interview without it. The most common reasons of voice failure have to do with straining and dehydration. The job fair is loud and it is common to raise your voice to compete with the noise. After a few hours of this, your vocal cords will be strained. Try to maintain a normal voice by sitting closer. Try to be aware of the pressure you’re put on your voice. When in doubt, speak softly! Also, stay hydrated. Drinking lots of water is a good idea, but carry a stash of throat drops too. Good luck at the Job Fair!